As many of you may have read on Blogger Buzz, Blogger has introduced a great new feature: "Followers". Read your favorite blogs (even those not hosted on Blogger) from the reading list in your dashboard. At present, this feature is not available to all Blogger users, though it is being rolled out for everyone to use over the next few weeks. Once your blog dashboard has been updated for the new "followers/reading list" feature, you can easily add new subscriptions to read in your Blogger dashboard. You can add a new blog by simply typing the URL (eg: http://www.blogsite.com). This does not need to be a Blogger powered blog, nor do you need to know the URL of the blog's feed. On the next screen, you can choose to follow this blog publicly or anonymously. Choosing to follow publicly means that your friendship with this blog is made public. 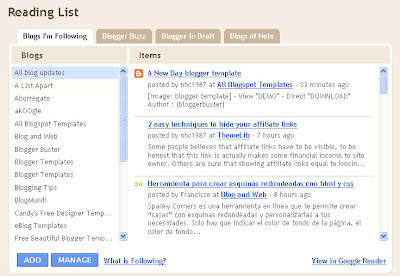 Those using Blogger can see a list of their public followers, and readers of these blogs can also access follower details if a Followers widget has been added to the blog. In the future, non-Blogger sites will have access to similar widgets to display their public followers. Choosing to follow anonymously is similar to subscribing to a blog feed in the normal manner: you would be counted among the list of followers, though your details and affiliation would be hidden. Alternatively, you can choose to import your subscriptions from Google Reader by checking the "Import from Google Reader" option. On the next page, you can see a list of all the subscriptions in your Google Reader account, then check the ones you would like to import. It can take a few minutes to import all of your subscriptions of you have many listed in your reader, so you may need to be patient! If you decide not to follow a blog you can easily edit or remove blogs in your reading list by clicking the "Manage" button. This will generate a page listing all of your subscriptions with options on the right to delete this from your reading list and to toggle between "Public" and "Anonymous" following. You can also add new subscriptions near the bottom of this page. In time, the "Followers" feature will also be integrated with FriendConnect which is built on Google's Social Graph API.Rather than being a social network in its own right, FriendConnect will link with other social networks and allow you to integrate your blog completely with your online social activities. I must admit that my research on this subject is sparse, though you can read more about the possibilities for FriendConnect on Google Operating System, the FriendConnect homepage and the OpenSocial pages. How do I use the Blogger reading list? What do you think of the "Followers" feature so far? I'd love to know your thoughts about the new Followers feature, so please feel free to leave your comments and opinions below.